Make these your next snack. Bagels are a big part of my family’s Rosh Hashanah and Yom Kippur observances. First there are the bagels the morning after Rosh Hashanah, which we celebrate at my cousins’ home in Connecticut. Then there are the bagels we break the Yom Kippur fast with. In both cases, our eyes are usually bigger than our stomachs, and we have several bagels left over. The best way to use leftover bagels—whether they’re a day old or three days old—is to make them into bagel chips. And they’re a great snack eaten as-is or, in the case of the garlic version below, paired with a dip such as muhammara, feta salsa, hummus, mock chopped liver or smoked bluefish pâté. Preheat oven to 350 degrees and place oven rack in middle position. Slice 2 bagels into ¼-inch-thick slices. The best way to do this is to create a flat, sturdy surface so the bagels don’t roll around while slicing. So slice the bagels in half crosswise, then turn each half so that the flat, cut side is facing down. This will make it easier to achieve even slices. In small saucepan, heat oil and garlic until garlic starts to sizzle and oil starts to bubble, about 3 minutes. Remove pan from heat and pour oil through fine-mesh strainer into small bowl. Discard minced garlic. Brush garlic oil onto both sides of bagel slices and arrange slices in one layer on rimmed baking sheet. Season to taste with salt (about ⅛ teaspoon per side). Bake for 7 minutes until top side is dry, then flip over and bake for 5 more, until both sides are golden-brown in color and dry. Serve with your favorite dip. Transfer 2 tablespoons butter to small bowl. Place remaining 6 tablespoons in small saucepan and cook over low heat, stirring often, until melted and golden-brown in color, about 4 minutes. Pour browned butter into small bowl with 2 tablespoons butter and stir until pieces have melted. 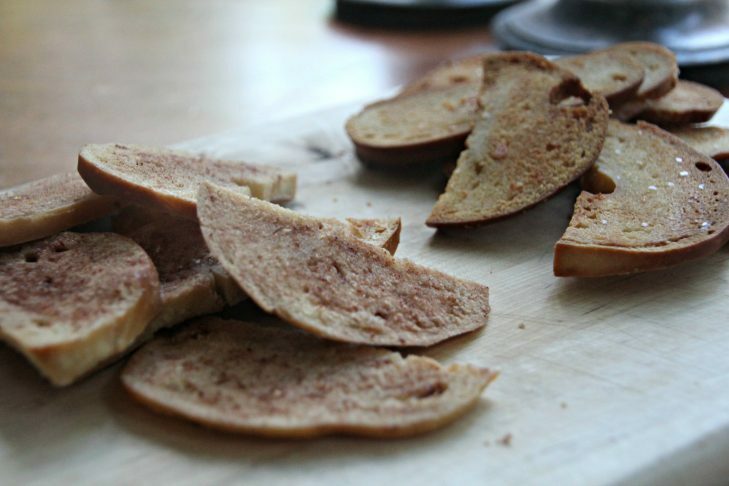 Brush browned butter onto both sides of bagel slices and arrange slices in one layer on rimmed baking sheet. Bake for 7 minutes until top side is dry, then flip over and bake for 5 more, until both sides are golden-brown around the edges. Meanwhile, whisk together sugar and cinnamon in small bowl. Remove pan from oven. Sprinkle cinnamon-sugar over top and serve.